The Easter Bunny is an iconic image that many people enjoy dressing up as at Easter time, or any time of the year. Thankfully there are many different Easter Bunny costumes available to choose from to help you create this classic look. The most convenient way to spring into Easter looking like a cute bunny is to purchase a costume with an attached tail. 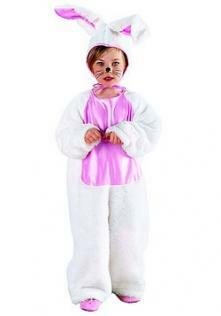 Easter Bunny costumes come in a variety of sizes from infants to adults. 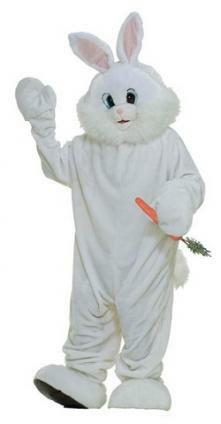 This adorable Easter Bunny costume for kids from HalloweenCostumes.com comes with a jumpsuit and separate head piece. The jumpsuit is white and features a pink satin belly. It is ideal for Halloween or everyday dress-up. It comes in sizes 4-6 or 6-8 and retails for $29. For babies consider the Infant Vanilla Bunny costume from CostumeSuperCenter.com. This is a chenille and flannel jumpsuit with a head piece that has ears and a carrot rattle. The costume features a multi-color bow tie and rabbit paws on the feet. It fits sizes 6 - 12 months and retails for $30. The Deluxe Easter Bunny Rabbit Mascot costume at Amazon features a plush, one-piece jumpsuit with an oversized tail and an oversized head. The costume includes attached hand and feet covers. It retails for about $70. This Adult Funny Bunny costume from Party City features a one-piece plush jump suit with a separate head piece. The costume includes white mitts for the hands, but does not cover the feet. It retails for about $100. The Plush Bunny Mascot costume from CostumeSuperCenter.com features a one-piece plush jump suit with an oversized tail on the back and an oversized head piece as well. The costume includes foot covers and hand mitts. It retails for about $100. This Deluxe Easter Bunny costume at Costumes4Less.com features a jumpsuit with a yellow, holiday-patterned vest, along with a separate head piece. It includes white gloves for the hands. It retails for about $123. This Bunny Rabbit Tail from CostumeSuperCenter.com is a large, fluffy white tail in a circular shape. The Adorable Bunny Tail at Amazon is a large, round tail that is attached to an elastic band. The elastic goes around the wearer's waist to secure it. If you choose, you can also make an Easter bunny costume yourself at home. Cut a large oval about the size of your chest out of the pink craft fur and glue it to the center of the sweatshirt. Twist four pipe cleaners onto the headband, two pipe cleaners on either side, with each set of two pushed close together so the pipe cleaners stick straight up. Twist the tops of each set of two pipe cleaners together and gently pull the sides apart so you create the outline of two ears. Wrap white craft felt around each of the pipe cleaner ears and hot glue into place. Cut pieces of pink satin for the centers of each ear and glue to the front of the fur. Glue the bunny tail to the seat of the white pants. Put on the pants, sweatshirt, headband and white gloves. Apply bunny face paint if desired. Whether you decide to purchase a bunny tail for your rabbit costume or if you decide to make your own, the most important thing to remember is to have fun wearing your costume. Get dressed in plenty of time for the party or other special occasion that you'll be attending so that you can get comfortable in your costume. Practice sitting down while wearing the tail so that you'll be prepared for doing so in costume.